I got home last night around 10:30 from NYC, pulled in and flipped the high beams onto the walkway. I got out, looked at my new walkway and was blown away. It is incredible. Just beautiful, and truly the old bricks give it a personality to match the house. I want to express my appreciation for your craftsmanship and for going with me on the recycled brick idea. I thought it would work, and the combination of the brick and your skill really pulls the front of the house together. A beautiful walkway can make a wonderful first impression or can add definition to your outdoor space in subtle, understated ways. And a well-designed patio provides a 3-season extension to your home. We can also mix natural materials with concrete pavers and retaining walls to accommodate the needs of larger spaces; for example, incorporating driveways or around swimming pools. Given the choice of a patio or low-elevation deck, a patio is often the better choice. Patios put people in more direct contact with the surrounding property, making a better outdoor experience with no need to look through a guardrail. They also offer lower maintenance and far longer life than a deck. Properly designed and constructed, your walk and patio will last virtually forever. That’s why we pay attention to all the important details. We focus on site work to make sure the base is of proper thickness, well compacted, and that all drainage issues have been addressed. We install the paving with particular care to make sure the full beauty of the design and paving pattern is achieved. Finally, we make sure the entire installation is secured in place at the perimeter so that your walk or patio holds together for a lifetime. Our installations include quarterly inspections for the first year to assure that the job meets customer expectations. Most projects also carry our 10-year guarantee on materials and workmanship. Elliptical patio and mustache shaped wall provide a relaxing location & visual interest. Bluestone patio and surrounding gardens sit directly below a mahogany deck. Bluestone walkway, designed and cut with precision, follows a perfect 90-degree curve to the patio. 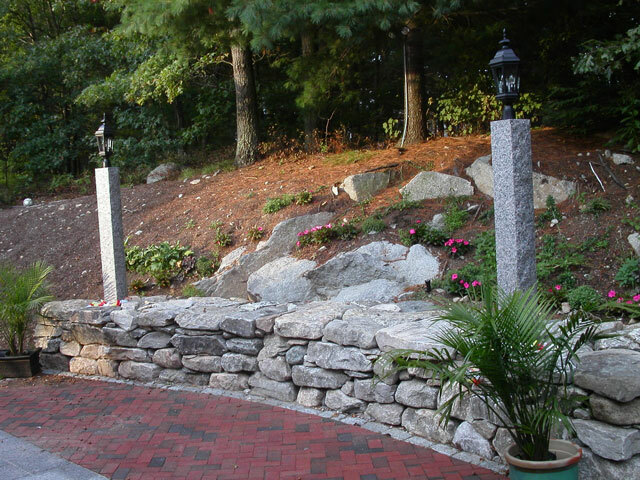 A brick patio with a granite inlay blends into the hill by utilizing a New England fieldstone wall containing two granite lamp posts. A climbing walkway of full color bluestone and granite steps flows around the mature plantings and invites you to the front porch. Two views - toward the front porch, and from the porch to the street. A raised bed at the house combines with a raised, curving walkway that eliminated one step into the house for a new look. In this front entrance redesign, curving granite steps and walkway transform the experience of approaching this home. Curving walkways made from concrete pavers. 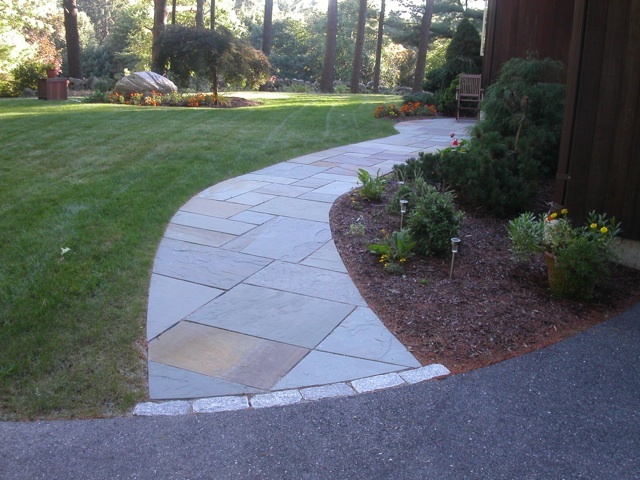 Curving walkway made from full-color, natural cleft bluestone. 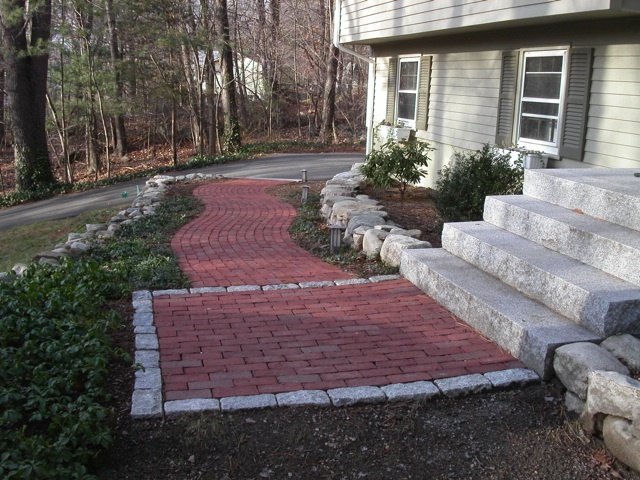 Brick paving, cobblestone edging and granite steps fit New England perfectly. Granite patios can be curved or rectangular. Full color, bluestone patio with rounded granite steps leading to the sliders replaces a previous deck. Project completion in December allowed early spring planting. This large patio forms the perfect outdoor room for family functions and entertaining. 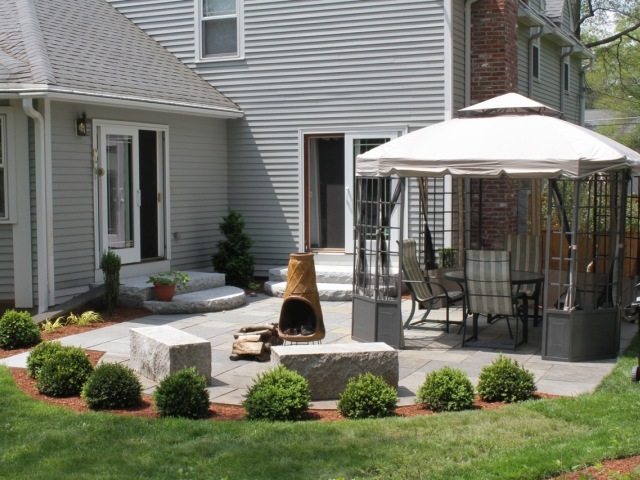 This bluestone patio is 44' long with a stone sitting wall on opposite corners. Bluestone patio replaces deck, adding beauty to older home. At this home, built in 1886, an aging deck addition had begun to present maintenance issues and felt confining to the owner. Now with the new patio, the original foundation is visible and enhanced by a garden area; and the owner can fully enjoy the beauty of the yard. Goshen stepping stones with grass between form a walkway that blends nicely into the surroundings. Goshen stone is strong enough to allow tractor drive overs. This walkway is heated during snow events. LED lighting built into the step and border enhance the experience after dark. This curving clay brick, cobblestone lined walkway with granite steps completely changes this home’s look. Brick walkway descends gradually with large granite steps. Small full-color bluestone patio sits directly over existing concrete patio. and withstands vehicular traffic without damage. Two sets of granite steps allowed the entire deck railing to be removed which opened the view. Multicolored paver patio contains an embedded circle kit as a focal point. Cobblestone lined pavers use a running bond pattern to follow the gentle walkway curves. This set of semi-circular granite steps leads to a full color bluestone patio at the back of a lakeshore cottage. A granite compass provides a focal point in this patio. 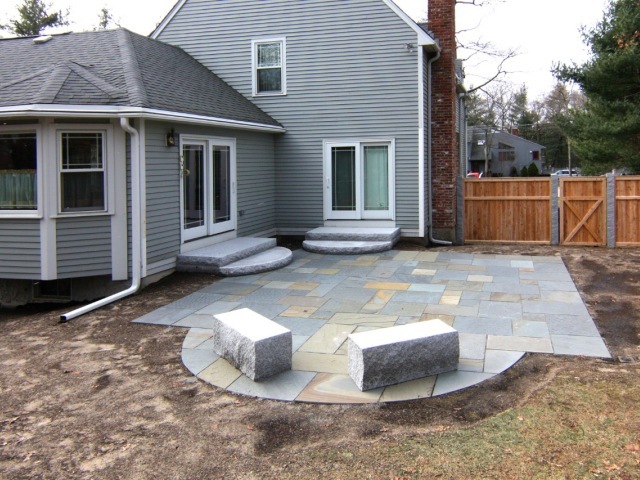 This full color bluestone patio uses two apex granite posts to define the corners.